Managed to get hold of the 2012 Guinness Book of Records from my local library, and motoring enthusiasts everywhere are probably going to be quite pleased with the number of entries that tie in with our interests. Not only do you have the usual two-page spread with all the record-breaking or record-holding cars, but in this latest edition, you’ve also got a special “Petrolhead” category and an alternative energy category. Given what we know about (a) the dicey nature of Middle Eastern politics and (b) the fact that the world’s got only so much crude oil in its crust and when it’s gone, it’s gone, that page featuring alternative energy is probably likely to become more and more important. Anyway, philosophical maunderings about energy sources, aside, what’s some of the great facts and records this year for the world of motoring? Take notes now – you never know when these facts might come in handy for a pub quiz trivia night. Fastest electric car: This record is held by the Buckeye Bullet 2, which, unfortunately, isn’t a production car but a project by some engineering students studying at the Ohio State University. Its top speed is a very impressive 487.672 km/h, which is more than four times the legal road speed – is that fast enough for you? Fastest solar-powered car: This record’s one that Australians can be proud of: it’s held by the Sunswift IV, and it can get up to 88.73 km/h. The Sunswift was made by the NSW Solar Racing Team. Longest journey by coffee-powered car: This isn’t a nutty idea from the USA but one from the eccentric Brits instead: they managed to get from London to Manchester in an adapted VW Scirocco that has a way to convert coffee granules into carbon monoxide (not so eco-friendly) and hydrogen, and the hydrogen fires the engine. The journey covered 337 km and did it at a fuel economy of 1 km per 35 expressos. Best selling-hybrid car: No surprises here: the record’s held by the Toyota Prius, which has sold over two million units since its launch in 1997. Best selling production car: This is held by the Toyota Corolla, which was the first car to achieve 30 million sales. The first car to reach 20 million sales, however, was the VW Beetle. The first car to achieve 10 million sales isn’t one you’ll find in our car reviews page: it was the Model T Ford. To get a little more specialised, the best-selling sports car is the Mazda MX-5. Greatest fuel range: Hold your head up high, Volkswagen: the Passat 1.6 TDI managed to get 2456.88 km on just one tank of fuel. Largest vehicle producing country: this is held by China, which also holds the record for the country with the larges vehicle sales (it’s just managed to beat the USA for this latter record). Vehicle with the largest mileage: a 1966 Volvo P-1800S managed to get over 4.5 million kilometres on the clock and it’s still going strong. Another record-holding Volvo is the XC60, which can proudly wear the title of the first car with a crash avoidance system. Fastest caravan tow: a person driving a Mercedes Benz S600 in South Africa managed to clock 223.88 km/h while towing a caravan – on an Air Force runway. Cops tend to get a bit grumpy if you try doing this on the roads. Fastest production car: This is still held by the Bugatti Veyron 16.4 Super Sport with a top speed of 431.072 km/h. 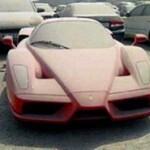 Most expensive car: Held by a Ferrari 205 GTO. The most expensive production car is the Mercedes-Benx CLK/LM. Remember the blog post from a couple of years ago where we featured the infamous ‘Bolivian Highway’? Well that’s nothing compared the the footpath featured below and filmed with a handycam. Yes I know this is a car blog and it is, I admit it’s a tenuous automotive link but it’s well worth a share … unless you don’t like heights. This is the ‘El Caminito del Rey’ (Kings Pathway) – an old abandoned walkway in Spain built in the early 1900’s to support workers activities at the nearby hydroelectric plant. 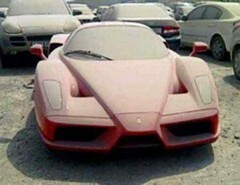 $1.5m Supercar abandoned in the desert. Backpackers often abandon their old car when they’ve finished tripping around Australia and return for home, British backpackers amongt them. But they wouldn’t abandon it if it was a Ferrari, and not just any Ferrari either. This hugeley rare Ferrari Enzo (only 399 made) and worth an expected $1.5 m was apparently abandoned by a British ‘backpacker’ in Dubai a while ago and now it’s coming up for auction. OK, he probably wasn’t a backpacker, but he was protective of his freedom. You see, being in debt is a jailable offence in Dubai, so it’s not that uncommon for foreign businessman to abandon their cars when they make ‘a rapid exit’ from this middle east nation. But abandon cars are usually fairly mundane machines, so this fleeing Brit must have incurred massive debts before his early departure 18 month ago.. The car, along with a over 100 others abandoned cars, will form part of a Police auction in Dubai today, and is expected to raise well in excess of a million dollars. FOOTNOTE:- It seems that the Dubai police pulled the car from sale amid world wide publicity, claiming that it is still needed for evidence of crime. It may be re-listed as soon as their enquiries are complete. So the speed you can get in a Porsche 911 or the Italian style of an Alfa Romeo aren’t quite enough for you and you want something exotic, fast and with plenty of style? Most people look to the big name Italian makers: Ferrari and Lamborghini. Well, most people look but only a handful are actually going to be able to buy one. I heard on the radio the other day that Lamborghini had launched something a little cheaper than usual. A car? Nope. Turns out that although Lambo have put out a number of new cars recently (which you won’t find reviewed in our car reviews page – we’re into cars that the average Aussie and the average business is likely to actually buy!) and have also put out a bike – a limited edition bike. This is not a motorbike, in spite of the Italian thing with little scooters like the Vespa. No, it’s a pushbike, so it’s up to you what the top speed is. To be sure, the bike is made from super-light carbon-fibre and has all the design features that help a bike go faster. And yes, it’s got the bull logo along with very aggressive styling designed to match the Lamborghini Aventador – and a Lambo-style price tag to match. Quite frankly, you can pick up a decent new car from a more everyday brand (e.g. Toyota) for the same price, so guess which one I’d rather spend the equivalent of €20,000 on! Lambo aren’t alone in dabbling in the world of pushbikes, which are, after all, supposed to be the most efficient machines ever invented (amount of energy put out is about 99% of the energy put in, with minimal energy converted to heat and noise). According to one news website, BMW, Land Rover and Porsche have popped their characteristic badges onto top-end road bikes, with HSV and FPV also having a go with mountain bikes. It’s considered widely to be a bit of a branding exercise, although it could also be a recognition of the upswing in good quality road bikes as a form of zero-carbon transport, especially in Europe. Well, minimal carbon, anyway, as you still breathe when you’re biking, putting out CO2, to say nothing of the methane coming from other end if you’ve eaten a carb-rich breakfast to power your biking efforts. The Lambo bikes (known as the BMC Impec Automobili Lamborghini Edition) are limited edition models and only 30 are going to be made, so we’re unlikely to see too many bull logos on the bikes in the racks around our cities. We’re unlikely to get any in Australia at all, so keen cyclists will have to just get Giants or the like. Actually, if you are desperate for something with the Lamborghini brand on it and are based in a rural area, the way that you can get a cheap(ish!) Lamborghini for your business (assuming your business is in the agricultural area) is to get a farm tractor. Lamborghini started out making tractors, and they still do. Naturally, they’re top-of-the line machines with torque levels that make what you can get out of even the juiciest sports car: 820 Nm from one model. They’re very popular in Europe, where you’re more likely to see a Lamborghini in the fields beside the road rather than on the roads. Love them or hate them, speed cameras are to stay. Actually, I don’t think that anybody loves speed cameras. Most of us would love to do what Rowan Atkinson does in “Johnny English” – fire a missile at that thing that’s just snapped us and blow it to smithereens. And in case you’re wondering whether this writer has recently had a wee picture of their car taken at an unexpected moment and is feeling grumpy about it, I haven’t. The idea of speed cameras around the place is a way of keeping speeds down. We all know the horror stories and the physics about high speeds and high-speed crashes. No matter how many high-tech active and passive safety devices your new car has, once you get a certain mass involved at a certain speed (sorry, make that velocity – I was listening in your class back at high school, Mr Cook), the forces involved and the law of the conservation of momentum mean that there’s going to be one heck of a bloody mess. Literally bloody. However, even knowing about what will happen if you crash at speed, some people still do it. Hence speed cameras and speed traps – if the idea of having your internal organs reduced to pile of mince doesn’t put you off heavy-footedness, possibly the idea of paying out will deter you. One thing that can be said in favour of the unmanned (unpersonned? unstaffed?) speed cameras is that they are unbiased. If a cop is manning the radar machine and taking licence plates, there is a risk that they will be biased by the style of car being driven. Hot sports car such as a Mitsubishi Evo or a Porsche 911 whizzes past? Whip out the radar gun and see what it’s doing. Little Mini Cooper or VW Beetle whips past driven by a silver-haired lady? Ignore it – even though said Mini or Beetle is quite capable of exceeding the speed limit. Speed cameras work on a fairly simple principle of physics – one that was taught later on in the year back in Mr Cook’s class. It’s similar to the echolocation used by bats and dolphins. The radar emits an electromagnetic signal, which bounces off the car, like that squeak by the dolphin bouncing off a fish. In a classic radar camera, the receiver on the apparatus measures the frequency that the wave comes back at, which is changed thanks to the Doppler effect (it’s blue shifted). The difference between outgoing frequency and incoming frequency tells the doohickeys inside the camera how fast the car is going and triggers the camera. The camera picks up a picture of your car and your licence plate, and you get hit in the wallet. A speed camera of the classic radar type can only pick up vehicles going in the direction of the radar, so if you’re going at right angles to it, you won’t get picked up. Can speed cameras pick up things that aren’t cars (and vans, motorbikes, etc.)? Yes, they can. The story about the UK cops picking up a NATO fighter jet on the radar, putting said fighter jet on alert and ready to put a missile into the radar system, is just a rumour, but speed cameras can pick up other vehicles. There have been cases of urban speed cameras picking up cyclists, especially if the cyclist is a fairly fit person on a modern bike with a tailwind going down a slope. Many people argue that speed cameras are just a way of filling up the police department’s coffers. However, they do keep speeds down, as folk have a tendency to go lightly on the accelerator if they think that there’s a speed camera in the area. There was a (true) story from New Zealand about a guy in a rural area who got fed up with the hoons speeding past his place, so he rigged up a fake speed camera involving a couple of boxes and a pumpkin in the open boot of a white stationwagon that looked like the Holden Commodores beloved by the NZ Police. The speeds of passing cars dropped considerably when this was parked on the road side. And now it’s confession time. When this writer was a uni student, we thought it was a hoot to be a fake speed camera. This involved parking up on the side of the road in an area where speed cameras sometimes lurked after dark. Switch the lights off but when a car goes past at a reasonable clip, waggle the controls to make the headlights go on and off quickly. All our victims would see was the flash and a parked stationwagon, and we’d snigger as the brake lights flared and the tyres squealed as some poor sucker thought they’d been clocked. Bet they spend several weeks wondering when the nasty letter was going to come in the mail. I don’t know what the cops would have said if they saw us – were we contributing to road safety, cheating them out of bagging a fine or simply pulling a harmless prank that was better than some of the other things uni students got up to? Lamborghinis are undoubtedly quick cars, but did you also know they are amazingly quick to burn out? A guy on a test drive found out yesterday when his car caught fire and burned to the ground in just a few minutes – as you can see here. That’s over $600,000 in Australian dollars going up in flames! Thanks to everyone who took part in our Easter Egg hunt. we had a massive entry, far more than we expected, but sadly there can be only five winners, which have been drawn at random from the successful contenders. A brand new TomTom ‘Live” sat/nav will be winging its way to each of the winners. New Car That Does 560mph for $499 Here! Apparently they had to hire a fully-fledged drag strip to test the model car and ratify the world record. Now that’s enthusiasm for you. There is, of course, a flourishing remote control car hobby group in Australia. Does anyone know the Australian speed record? What’s in a Number – $13.6m?? There was a time when ‘personalised plates’ meant two letters, usually your initials, followed by three or four numbers-usually your birthdate…and they were free! How things change. Next there was a small registration fee, but the plate was yours for life, then a wider range of letters and numbers could be specified and then there were annual fees. Now there is a huge range of choices which vary from state to state…and a huge range of fees charged by each State Roads Authority. The best deals seem to come out of the smaller states, where in Tasmania and South Australia, for example, a once only fee can secure a wide choice of personalised plates. In the bigger states, however, they are optimising their income with an ever widening range of choices and an even wider range of pricing. Then, of course, there is the ‘second hand’ and ‘precious plates’ market. The highest prices ever reached for an Australian plate reputably runs into hundreds of thousands of dollars for number ‘888’ (unconfirmed reports also say the NSW plate no ‘6’ has also sold for a price approaching $1m), but that pales into insignificance when compared to the World record price. This plate sold three years ago in Abu Dhabi to a local businessman for an unbelievable $13.6m! Now let’s return to earth and see what’s around us. Our next door neighbour for a number of years carried the rather strange number plate PUMP FE on her Nissan. She managed the local gym. Weird, meaningless? Well, not really, when we finally worked out that “fe’ is the chemical symbol for iron. Even more obscure was a local Toyota Corolla with the number plate, TIH5HO ,which puzzled us for ages. Until one day we saw the car- and the plate, in our rear view mirror. Then it dawned on us. The State Roads Authorities won’t permit offensive or rude plates, so it wasn’t long before they woke up and withdrew consent for this clever number. We notice, however, that some states will still permit this configuration to be purchased, which is a surprise (if you can’t work out why, have a look at the mirror image). These are just two of the clever plates on the road, others include RU NXT (on a hearse), or RUNVS (on a Porsche). The last one we saw simply said ‘SORRY’. As it happened the car was in front of us in a traffic jam. Well, it wasn’t their fault, so what were they sorry for?? There are, of course, many more clever and funny number plates around. If you’ve seen one that is clever, or funny, let us know. Also what do you think about personalised plates? For sure they make money for the Government, but do they just satisfy an ego crave, or do they serve another role? We want to hear from you so leave a reply below. Volkswagen is up in arms over a bogus TV ad that has gone viral on the internet. Here is the ad that purports to be a genuine ad that is going to air in Ireland and the UK. Whilst it is quite clever, and in the genre of VW advertising, it is far too provocative and racially offensive to pass all the regulationary codes. In fact it was produced by a creative commercial TV outfit who speculatively presented it to Volkswagen’s advertising agency. They, of course, rejected it as highly inappropriate. But somehow it got onto the internet under the guise of an official VW ad, and has gone viral. According to the VW PR people, they are extremely annoyed and have commenced legal action against the perpetrators. Still, to the average person, us included, when you get the email it seems authentic….so, how do you find out it isn’t? Well, we simply Googled the titles to find out it was a con, but most people wouldn’t. We reckon this is a dangerous trendsetter, but how can you overcome it?